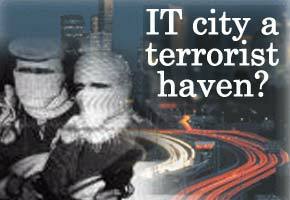 rediff.com: IT city a terrorist haven? Are you the target of a national manhunt? Just take a ride down to Bangalore, the city with the fastest growth rate in Asia. You will find it quite easy to hide yourself amidst the city's large floating population, which the police estimate to sometimes be as high as 200,000 per day. The most recent case was when some suspected terrorists, wanted by the Tamil Nadu police, were killed in a major shootout in Bangalore's MS Ramiah Layout. Two years ago, the police had arrested some Deendar Anjuman activists on the charge of planning to carry out explosions in a church while gangsters from Mumbai were apprehended in 1998. The Andhra police often drive down to pick up wanted naxalites who are hiding in the city and last year shot dead Chini Sudarshan, a naxalite-turned-extortionist, on the city's outskirts. In the 1990s, suspects from the United Liberation Front of Asom were tracked down in the city. The Mumbai police have apprehended gangsters seeking to sneak out of India from Bangalore airport. The maidservant who robbed then Miss Universe 1994 Sushmita Sen's residence in Calcutta in 1995 was apprehended in Bangalore! And perhaps in the most famous case of them all, the assassins of Rajiv Gandhi were killed in Bangalore way back in 1991. India's garden city has over the years now acquired the reputation of becoming a sanctuary for terrorists and antisocial elements wanted in others parts of the country. The city's salubrious climate, hospitable residents and distance from trouble spots, the very reasons why multinationals chose to make it their operation base, have also, ironically, become the reasons why militants on the run find it a convenient refuge. Unfortunately, there is little data available on the number of persons from different states being arrested. The reason: a police team from the state in which the militants are wanted usually acts directly on a tip-off and raids their hideout in the city, after informing the local police who, being overburdened, are quite happy to stay out of the action. The raiding team takes away the militants and often records that the arrest was made in the home state rather than Karnataka. There have even been occasions when the raiding police team does not even inform the local police about is presence to arrest some wanted criminal. For instance, when the federal Intelligence Bureau arrested a terrorist who was apparently planning to kill federal Home Minister L K Advani, the Bangalore police learnt of the case only the following day. The police believe that over 100 Pakistani nationals have simply disappeared in the city over the past few decades. Since foreigners entering Bangalore have to register themselves with the police, many of them give out a false name and then simply melt into the populace. "Thankfully, the visiting terrorists and underworld dons have made no ideological incursions into Bangalore," says H T Sangliana, former Bangalore police commissioner and currently inspector general of prisons. "They just use the city as a temporary refuge. However, the police here is being very vigilant on this front and we want to send out a clear message to terrorists that Bangalore is no longer a safe haven for them." One of the key reasons that many wanted persons prefer Bangalore as a sanctuary is the city's cosmopolitan nature. While native Kannadigas are the single largest linguistic group in Bangalore, they form less that 50 per cent of the city's six million population. Few large metropolises in India, with the exception of Mumbai, have such a cosmopolitan mix. Thus, every second person on the streets of Bangalore is probably from outside Karnataka, and a non-Kannada speaking person can get by perfectly with Hindi and English. The second is that Bangalore has experienced a sudden rise in the number of cash rich people floating around, thanks to the tremendous growth in the city's IT industry over the past few years. Third, Bangalore has a huge number of engineering colleges, which attract students and youngsters from all over the country. The city's pleasant climate has made it a popular holiday destination for tourists from all over India for many years now. The high incidence of dacoities in Bangalore since 1986 has helped the fugitive terrorists too. "The movements of dacoits mask the movements of the militants," says a senior intelligence officer. The police notes that 90 per cent of the dacoits arrested in the city actually belong to other states. And often, dacoits from Uttar Pradesh arrive in Bangalore to dispose off their stolen goods! However, the police fear that the gangsters might move from seeking sanctuary to targeting the local population. Gangs of kidnappers from north India are known to be active in the city while many elderly persons have been killed in recent times. And now, sources in Karnataka's Intelligence Bureau say that they have warned the Karnataka government of the possibility of attacks by Kashmiri militant groups at the many important defences installations that dot the city. An attack on Bangalore is likely to draw the attention of the international community given the many foreign firms, especially from the United States, that have set up offices and workstations in this city. Unfortunately, training in intelligence gathering is not a part of police training in Karnataka. Only two police officers are picked every year for an annual training camp conducted by the state Intelligence Bureau, and these officers serve hardly any time in intelligence before they are transferred off to other areas of the police force. The intelligence wing of Karnataka police comprises 520 personnel including 200 officers, which is simply not enough for this burgeoning city. And this is shown by the fact that the Bangalore police have stumbled upon the criminals through sheer luck rather than detect them. For example, the Deendar Anjuman culprits came to light only after the van in which they were carrying explosives accidentally exploded in the city killing two fundamentalists and injuring a few others!